Wow it’s hot. The heatwave is starting to have an effect on me, I’m tired and cranky and have no desire to do anything but lie on the couch and read novels. Not that there is anything wrong with that, it’s pretty much a perfect afternoon for me, but it is hard to be productive when you’re melting. For anyone not in Australia we’re currently experiencing some super hot and dry days, with temperatures exceeding 45° in some areas. It’s been up to 38° here at home and I’ve spent some of those days moving furniture around, which in hindsight was not the smartest idea. Unfortunately my problems are only minor compared to others, as the heat is leading to bushfires throughout the country and many people have lost everything. If you’ve been affected or you’re in a risky area I hope you’re safe and doing all right, my thoughts are with you. When it’s this warm it is hard to get up the motivation to bake anything and turning on the oven seems ridiculous. This is where these desserts come in. 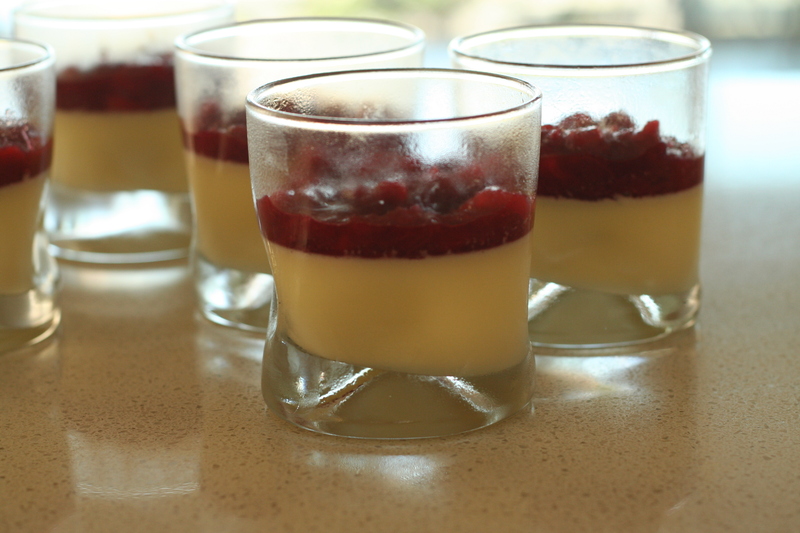 Creamy smooth pannacotta, fragrant with the smell of almonds layered with tangy bright rhubarb – it’s the perfect treat to cool you down. 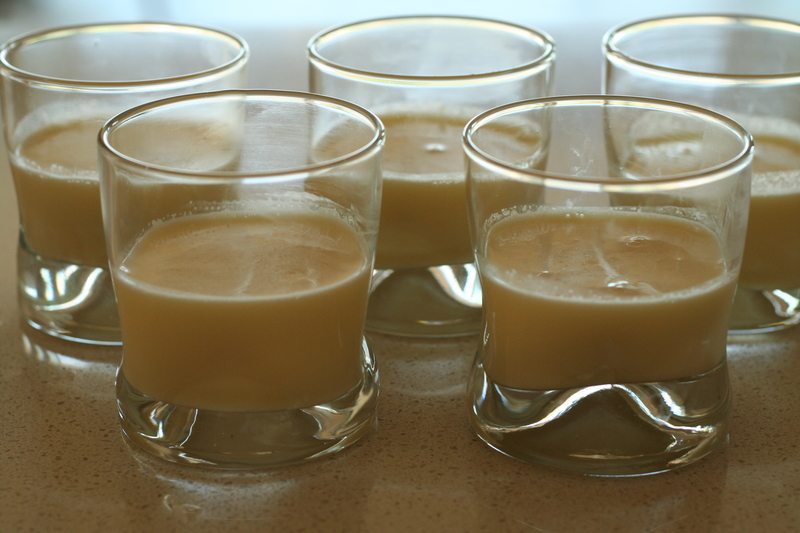 The almonds infuse really well into the milk and leave a sweet and strong liquid that sets to give a complex and delicious custard. 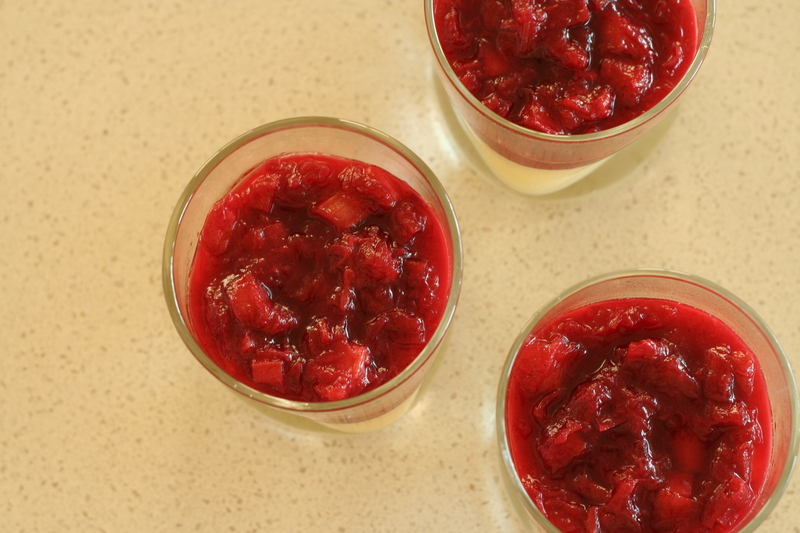 While they’d be fantastic just like that the rhubarb simmered with vanilla gives a great contrast and freshness to keep the dessert from being too heavy. If you don’t have a vanilla pod use a teaspoon of vanilla essence instead. If you buy pre-toasted almonds there is only a small amount of stove work needed, so this is a simple and delicious treat for a hot day. 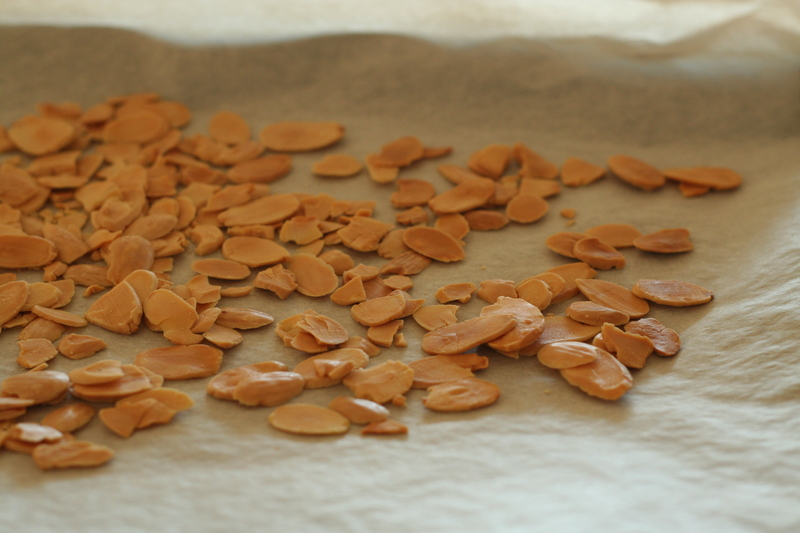 Preheat the oven to 180° and spread the almonds on a tray. Place in the oven and toast for 5-10 minutes until golden and fragrant. While cooking place the cream and sugar in a saucepan and bring to the boil. 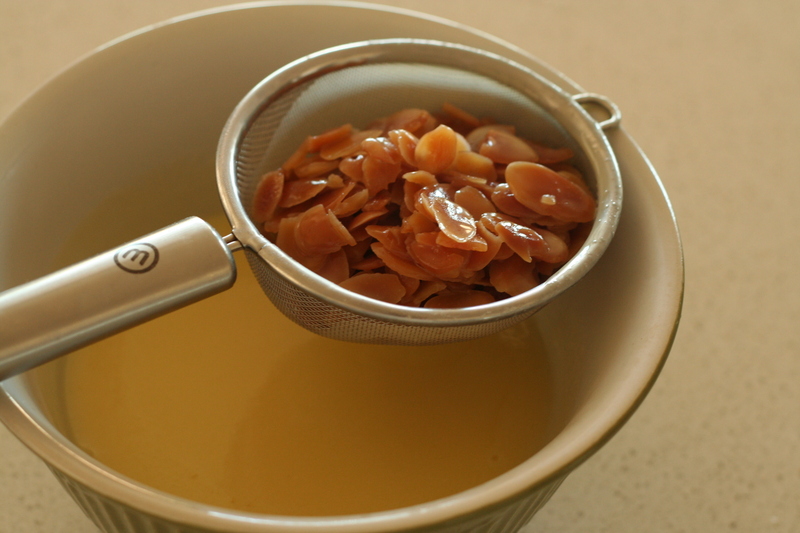 Once toasted immediately add the almonds to the mixture and turn off the heat. Cover with a lid and let sit for half an hour to infuse. Sprinkle the gelatine over the almond mixture and turn the heat back on until small bubbles appear around the edges of the liquid. Stir the mixture thoroughly to ensure the gelatine is dissolved. 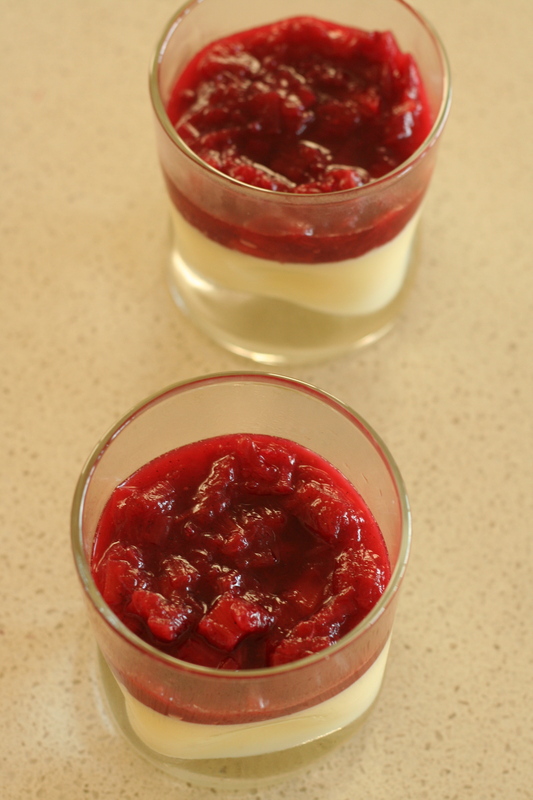 Strain through a sieve then ladle into glasses or pannacotta moulds. Place in the fridge for half an hour to cool before adding the rhubarb. 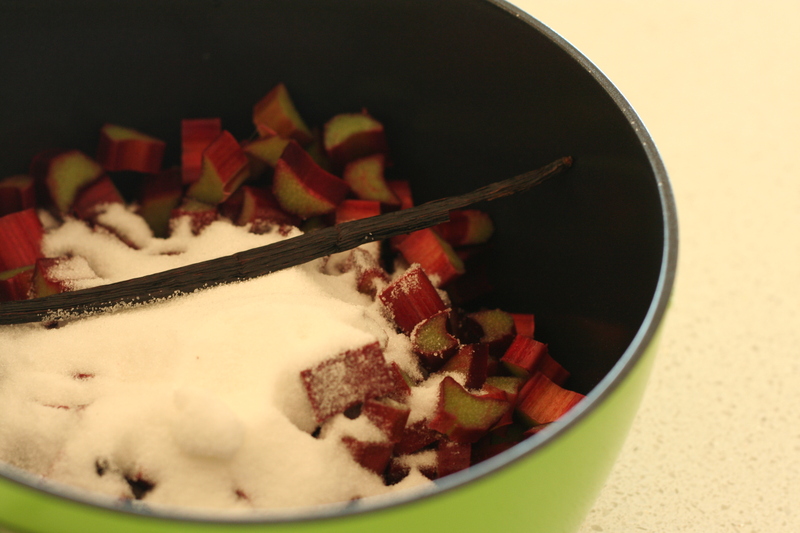 Place all ingredients in a saucepan and heat over medium heat for 10-15 minutes or until the rhubarb is soft, stirring occasionally. 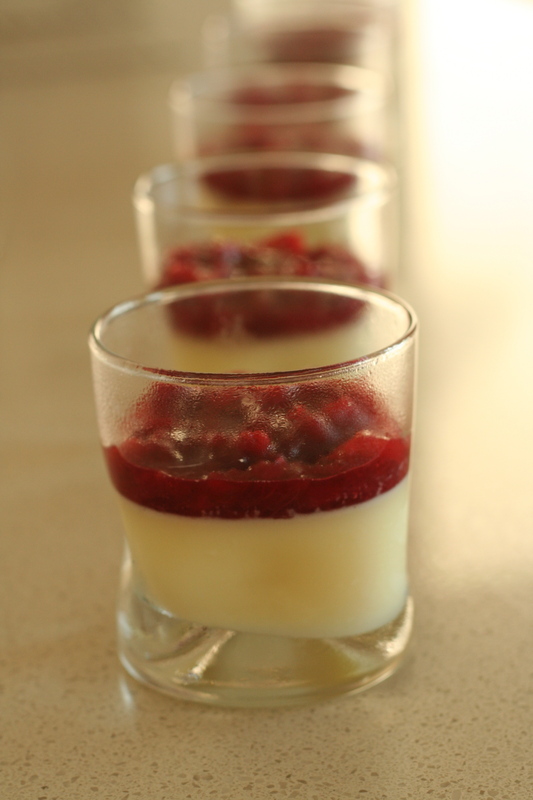 Remove the vanilla pod before spooning on top of the pannacotta. Return to the fridge for another hour to set completely. Soooo on board with low impact, cool cooking. It’s hot in Brissie too. I’ve been working on a citrus spritzer and a me version of tzatziki while huddling in the airconditioning, or cooling on the pool. Bring on autumn! Congratulaions on the medicine thing – my husband is about to start med. next week! Heard about the heat wave. Stay safe over there! It’s like you knew that I’m in the middle of (beating my brains out over) cram time at school right now–so glad you shared this easy dessert to keep a girl’s sweet tooth sane! I haven’t had a chance to make/post anything in too long, it’s been so busy; hope things stay cool in your neck of the woods! Such a good idea,and it sounds delicious! I’m in Sydney and might make this tomorow- it’s due to hit the 40 degree mark 😦 good luck staying cool! !